Here’s a chart for California that complements one I’ve posted for Massachusetts. It tells the same story; health care is drawing an increasing proportion of resources, leaving less for other government functions. 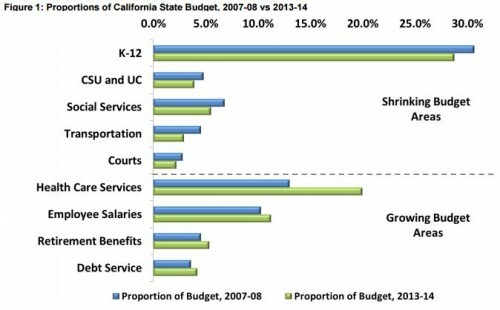 The chart is from a California Common Sense report. 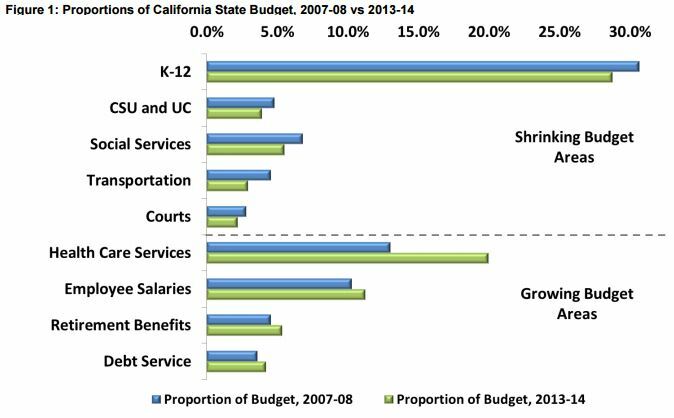 The growing proportion of the California state budget devoted to health care is even higher than the “Health Care Services” bars of this chart suggest. A great deal of “Retirement Benefits” growth is due to health care too. Annual state contributions to retirement benefits – pensions and retiree health care – have increased $1.5 billion, or 24.8% . In particular, annual retiree health care payments have increased $682 billion, and thus account for nearly half of the retirement cost growth. Furthermore, among annual retirement costs to the state, health care for retired employees and their beneficiaries grew the most – 61.2%. By comparison, annual pension contributions increased $790 million, or 16.4%. We should not overlook the likely possibility that many of the services losing budget, in relative terms, also probably contribute to health, and may do so more efficiently than some direct health care spending: education, social services, and transportation.